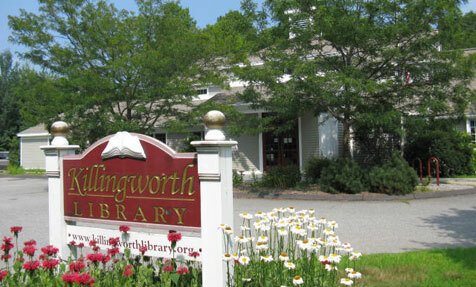 Killingworth Library started in 1964 with the can-do spirit of local people willing to roll up their sleeves to find space, build shelves, donate books and manage the desk. Today, community donations and town support have given us a beautiful library facility with something for everyone. Our Library Association is a non-profit organization run by 18 hard-working volunteer board members who are responsible for raising more than $96,800 of our annual budget this year, with the Town generously funding the rest. To keep costs down, we do a lot of hands-on work in fundraising, finance, program planning, computer maintenance, security, grounds upkeep, and interior building maintenance. 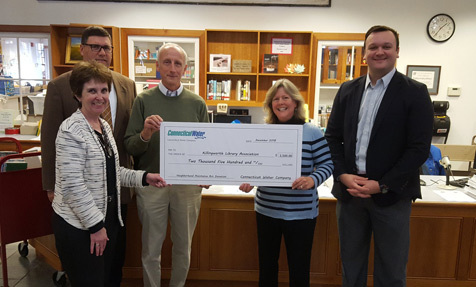 CT Water Company representatives visited Killingworth Library in December to present a check to support energy conservation projects the Killingworth Library Association proposed in the State's 2018 Neighborhood Assistance Act program. From l-r: CT Water Company representatives Maureen Westbrook and Craig Patla, KLA Board members Roger Nemergut and Alison Karam, and State Representative Jesse MacLachlan, 35th District. Great Gift Ideas at the Library! Whether you need to pick up a little something for your student away at school, a host/hostess gift, a stocking stuffer, or a unique gift for someone who has everything, the library can fill your shopping needs. The Killingworth Library has convenient shopping hours: anytime we're open! 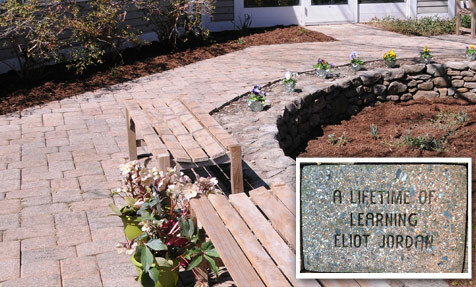 In 1995 one of the many fundraisers to get the present library built was the reading garden commemorative bricks. 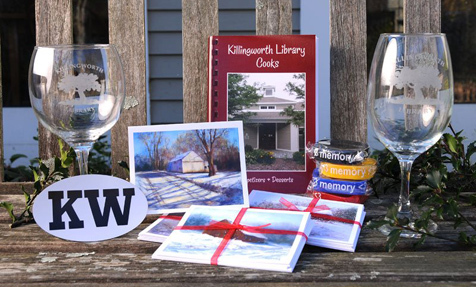 Back by popular demand, they are now available once again to celebrate the 50th anniversary of the Killingworth Library Association. You may purchase a 4 x 8 brick, engraved with up to three lines of text with 21 characters per line including spaces and punctuation for $500. Earth Day Fest 2019 is Coming – Buy Your Tickets Now! No storytime on 4/27 – come see us at the Earth Day Festival!